While VR on mobile seems to be forgotten, or at the very least — frozen for the time being — a lot of effort is being put into AR (augmented reality) — the technology that lets you put virtual objects into the real world and observe them through your phone's viewfinder. One of the most popular AR apps as of late was Pokemon GO, which became a craze in 2016, but it really only scratches the surface of what AR can do. Now that Apple's ARKit and Google's ARCore platforms are live and in the hands of developers, a lot of talented people are pushing the envelope, looking for what's possible and what the future might bring. Such is the case with Street Fighter II “Real World Warrior Edition”. Now, please note that this is not an official release and we don't know what Capcom has to say about it as of yet. It's not available for download and is only presented as a concept by its developer Abhishek Singh. You may remember that name from another concept AR game, which brought Super Mario to our world. Anyway, what do we have? 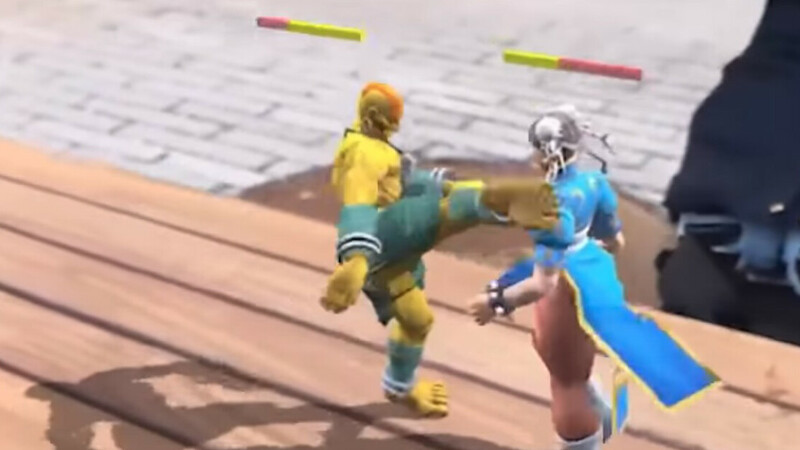 A demo video which shows us two iPhones playing Street Fighter in AR. The virtual warriors are placed anywhere in the world and are actual 3D models. You can go close and inspect them, you can go around, look at them from above or below. Both phones keep well in sync and show both players the same fighter positioning and results. Now, yes, the fighting mechanics and animations by themselves do look to be very, very clunky. The developer did say that he'd love to improve the game more, but he is unsure "what Capcom has to say about it". In other words, this was made as a concept and demonstration and there isn't much use in trying to develop it as a commercial product as the developer might end up being blocked from selling it anyway. While these AR games are fun to look at and add an extra dimension, the way you have to hold your device really doesn't feel like a natural way. Good in theory but not well done at all and agree with Rebel, holding your phone like this for any length of time is not a good experience. This is a great proof of concept and if developers take advantage of this and are able to pull it off in a way that is fluid and speedy, this would be dope. Add controller support and this could take off.